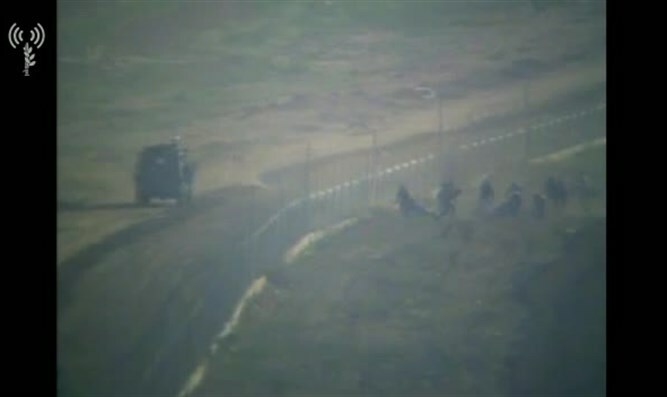 Hundreds of Palestinian Arab rioters attempt to infiltrate Israel and burn the security fence along the Gaza border. Hundreds of Palestinian Arab rioters attempted to infiltrate Israel and burn the security fence adjacent to the Karni Crossing in northern Gaza on Friday afternoon. The IDF said the rioters approached the security fence, hurled rocks and firebombs, and tried to light the fence on fire. In response, IDF troops operated in accordance with the rules of engagement and thwarted the attempted infiltration. Later on Friday, over 10,000 Palestinian Arabs participated in riots and made attempts to harm security infrastructure, roll burning tires, hurl rocks and fly kites with flaming objects attached to them. In response, IDF troops used riot dispersal means and fired in accordance with the rules of engagement. “The IDF operates to protect Israeli civilians and will not allow harm to be done to the security infrastructure that protects them,” the IDF Spokesperson’s said in a statement. Gazans began their violent riots, under the name “the March of the Return”, on March 30. 44 Arabs have been killed since the riots began, the health bureau in Gaza said Friday. Earlier on Friday, the UN High Commissioner for Human Rights, Zeid Ra'ad Al Hussein, criticized Israel and urged Israeli forces to stop using force to prevent the Arab rioters from charging Israel’s security fence. "Warnings by the United Nations and others have seemingly gone unheeded, as the approach of the security forces from week to week does not seem to have changed," he added. Last week, the UN’s Special Coordinator for the Middle East Peace Process, Nickolay Mladenov, accused Israel of killing children following the deaths of Palestinian Arab teens in the violent riots.